In October 1911, two teams of adventurers were heading separate expeditions toward the South Pole – one led by Roald Amundsen from Norway and the other by Robert Falcon Scott of England. Amundsen adhered to a regimen of consistent progress, traveling 15 – 20 miles per day, resisting the temptation to go farther in good weather, in order to avoid reaching a point of exhaustion that could leave his team exposed, and pressing ahead even in nasty weather to stay on pace. Even when they were only 45 miles away from the South Pole — with splendid weather, the ability to reach the pole in one 24-hour push, not to mention the threat hanging over his head of Scott reaching there first – what did Amundsen do? He went 17 miles. Amundsen’s disciplined approach turned out to be critical not only to his success but to his survival: he and his men emerged victorious, clocking in at the South Pole right on pace, averaging 15.5 miles per day. 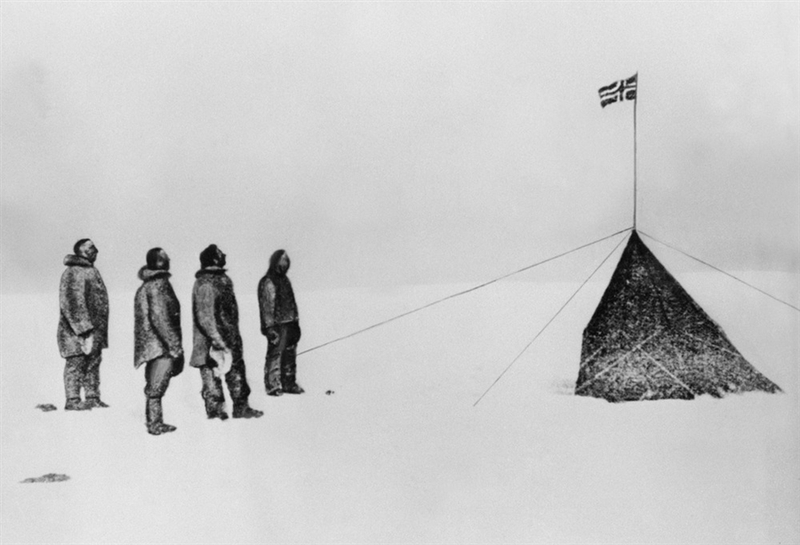 Scott and his team discovered the flag Amundsen had posted there when they reached the Pole 34 days later. Having to turn around in bitter disappointment, they perished on the way home from a combination of exhaustion, starvation and extreme cold. Citing the parallel paths and dramatically different attitudes of Amundsen and Scott as an example in their fascinating book Great by Choice, Jim Collins and Morten Hansen detail the results of nine years of research into why “10X companies” — companies that beat their industry index by at least 10 times over the course of three decades — are able to create exceptional outcomes despite chaos and uncertainty. One of the key leadership traits they identified at the set of exemplary companies they examined, was a “fanatic discipline” – the ability to establish consistent action in line with a core value, method or standard over long periods of time. In establishing what Collins and Hansen dubbed “The 20-Year March,” the leaders of these companies established two kinds of self-imposed discomfort: 1) an unwavering commitment to high performance in difficult conditions; and 2) the restraint to hold back in good conditions. Southwest Airlines, for example, was able to generate a profit every year for 30 years — despite an environment rife with high-profile bankruptcies, deregulation, fuel shocks, union strikes, and terrorist attacks. At the same time, CEO Herb Kelleher resisted the lure of fast expansion in good times, even if it meant leaving growth on the table: In 1996, Southwest had demand for service from 100 US cities but expanded to only four – how many companies have the self-restraint to stick to the plan in the face of seemingly easy opportunity? As CEO of Progressive Insurance in the late 1990s, Peter Lewis faced a seemingly irrational Wall Street driving the stock price up and down. He decided to stop playing the “I’ll tell you what we’ll earn and you’ll predict what we’ll earn” game that most companies play with analysts on a quarterly basis and — in a revolutionary move of self-imposed accountability — became the first SEC-listed company to publish financial statements on a monthly basis. And though Paul O’Neill wasn’t specifically focused on the bottom line when he became CEO of Alcoa in 1987 and famously declared workplace safety as the company’s number-one priority, by the time he retired in 2000, the company’s annual net income was five times larger than when he arrived – its market cap had risen by $27 billion and the company’s worker injury rate had fallen to one-twentieth the U.S. average. The thing is, consistency is predictable and therefore boring. Our egos crave the adrenaline rush, the drama, the roar of the crowd that comes with an unexpected or breakout effort. Constant switching between different strategies or programs – think of the people who jump around between every diet and exercise trend — kills momentum and motivation. It takes exceptional discipline to adhere to the game plan, to not give into emotion, and to resist the pressure to conform, to follow the herd or pull ahead of the competition. Former Navy SEAL Commander Mark Divine, who provides hard-core physical training at his SEALFIT camps, tells the boot camp version of Aesop’s fable of the tortoise and the hare. In a 1000-push-up challenge, most of the guys, typically 20 years younger than him, start out at breakneck speed, cranking out 60 push-ups at a time. They can’t maintain the pace, however, and soon they’re slowing down to 40, then 20, then 10… Meanwhile, Commander Divine starts off with a controlled, steady pace, taking a deep breath every five push-ups and, inevitably, overtakes the others to win. Consistent performance starts with disciplined leaders and teams. Like a muscle, you can only develop discipline by exercising it: whether you’re in sales knocking out 50 cold calls every week, a marathoner sticking to a pre-determined pace, a football coach making sure your players train in all kinds of weather and conditions, or the principal of a charter school making top literacy scores your number-one priority. What is one area where you could improve consistency to create your own 10X results? The problem is, companies don’t want controlled, sustained performance. Corporations want your all, every day. In addition is the expectation of continuously improving performance. No one can maintain infinite performance improvement. Any job requiring sustained, controlled effort is done by machines, whenever possible. Or unskilled labor. Whichever is cheaper. They end up consistently working their charges to death in the name of consistency. They consistently volunteer for projects they consistently push their people to do more they consistently seek that constant feel of adrenaline. That is the problem. Superb consistency. The charges become consistently strung out. Not bosses who have a consistent and disciplined approach to managing the inundation of work that flows in. Amundsen was a clockwork person with no focus except exploration. Sure he made it to the Pole, but it was his one and sole interest in life. There was no emotion, no excitement, no joy in his work. Scott was a naval officer long before ever he ever thought of heading south, not to mention husband and father. It was a part of his life, but it wasn’t his entire life. I’ve lived very long stretches of time where all I did was work, eat and sleep towards a goal. For the first few years focus and determination kept me going. After a decade though, depression seeped in from consistancy-induced numbness. Going clockwork is not living, yet it seems so many memoirs of successful types describe living as clockwork things. Executing the same program for decades without no emotion or inner life. Dead inside, basically.